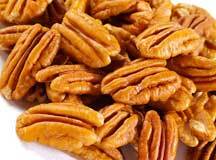 Put the pecans and carrots through a food processor until it comes out as a pate, and set aside in a separate bowl. Next, put the red pepper, onion, basil and cilantro into the processor and blend. Remove from food processor and add the mung beans, rice, lemon juice and other spices and blend by hand. Shape it into a loaf and place it on a serving platter. Garnish with pecan halves and red pepper halves. The greatest benefit of this recipe is the life force energy or chi that is delivered with raw, organic ingredients. Also, sprouting beans and rice increases their protein content. The spices stimulate digestive fire for easier assimilation of nutrients by the body.